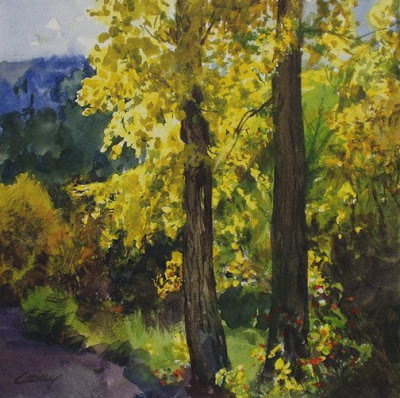 Watercolor on paper, 6" x 6"
The cottonwood is my wife Brenda's favorite tree. I love it too. They grow to great heights, stately and elegant, along the river bottoms. I like to sit in a grove and watch their broad leaves shimmer in the sun, much like aspen or birch. I close my eyes and listen to the sound they make in the wind, like the chatter of a thousand voices softly saying "Shhhhh." Very nice feel of light.